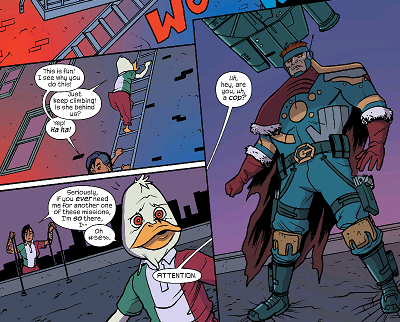 Howard the Duck is back! And his new series is actually really good! Howard the Duck. Unfortunately, when most people hear the name, they immediately think of the pretty awful movie from the 80's. But before that, Howard the Duck was a real funny comic from Marvel by Steve Gerber and Val Mayerik. Marvel has tried to bring the character back a few times over the years, including having him as a regular in Generation X for a short period of time, but he just never seemed to go much higher than cult favorite. Last year, Howard the Duck had a brief cameo appearance in the credits of Guardians of the Galaxy. Since Guardians was such a huge hit, Marvel has seemed determine to flood the market with Guardians-related series. Just last week, they announced that Groot is getting his own book soon too. 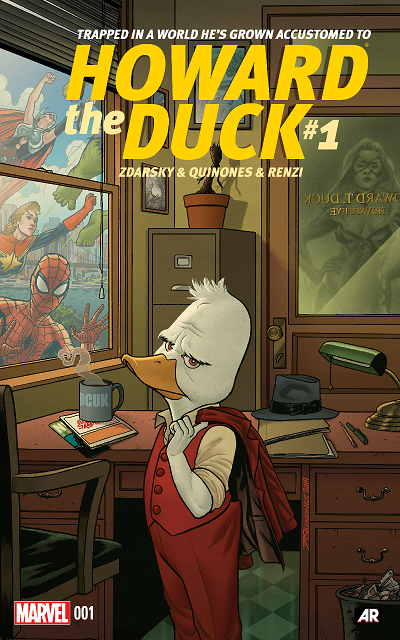 So, I'm not surprised that they decided to give Howard the Duck another try. What did surprise me though, was that this issue was great! In this series, Howard is working as a private investigator. The issue starts with Howard in jail where he meets a girl named Tara Tam. Neither of them have any kind of public records before the last few months. Howard because he was brought here through the Nexus of All Realities. Tara claims that her parents kept her off the grid, and she only moved to New York because she wanted to have more adventure in her life. The police do let them both go a little too easily, but it does provide a quick way to introduce us to the characters. Later, Howard is hired to find an artifact stolen by Black Cat, which brings him into contact with Spider-Man. Spider-Man refuses to help him (because of his own issues with Black Cat in recent months. She's basically set herself up as a mini-Kingpin, and she has a real hate for Spider-Man because of the actions of Superior Spider-Man. Howard is looking for another lead to find Black Cat and stumbles into Tara once more who's able to help him. Howard ends up hiring her as his unpaid assistant. They find the artifact, and as they try to escape, they are attacked by an agent working for the Collector. After a confrontation involving the agent, Black Cat, and Spider-Man, Howard is zapped by the agent and ends up transported to the Collector's ship. There he meets Rocket Raccoon, who is planning an escape. One thing that immediately caught my attention about this book is that it used current Marvel continuity so well. She-Hulk and Spider-Man both make appearances, and those appearances are tied tightly into their series. Howard's Private Eye office is in the same building as She-Hulk's new law firm, and many of her supporting cast show up for cameos. They show quick glimpses at Parker Industries, and talk a lot about what Black Cat has changed into over the last few months. These were nice touchs that helped keep the series grounded. The humor on this book pretty much landed every time. For me, writing humor well is hard, but Chip Zdarsky did a great job. From Howard fighting with his cellmates on Earth to him introducing a client to his assistant (who is basically a stack of papers with a mop for a head), I laughed quite a few times while reading this issue. I also loved the training montage with Howard getting Tara ready to be his assistant. But the funniest part might have been Howards' overly complicated plan to sneak into Black Cat's office disguised as pizza delievery men. It was just such a quirky scene that made the issue really start out. Beyond being funny, this was just a real well written comic. Howard isn't particularly deep or complicated character, but I immediately got what he was all about. And Zdarsky also got She-Hulk, Black Cat, and Spider-Man perfect...though I did think Spider-Man collapsing after he thought Howard was killed might have been a little much. The Rocket Raccoon appearance in the end is probably a little gratiutious. 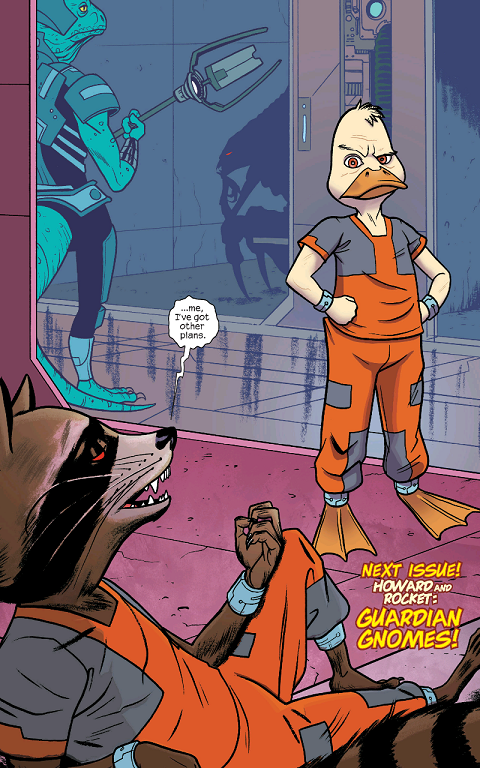 But, I do think a Howard the Duck and Rocket team-up is a long time coming, so I am excited to see it anyway. In my review of Bill and Ted a few weeks ago, I had commented that I hate when the cover art is vastly different from the interiors. And that happened again here, which is even stranger because it's the same artist. For the most part, I did think the cartoony art style worked well, but there were a few places where some things could have used a little more detail. A lot of the art is real good, but it's not always consistent throughout the issue. My only real concern about this issue is that I hope it doesn't stay in space too long. The mysteries about who Tara is and what her intentions are were one of my favorite things about this issue. Jumping to space takes away from that. Like I said when I started this review, we already have too many space based Guardians of the Galaxy related comics. I would prefer this one be more grounded. But, either way, this was a great first issue. Funny, well written, and the art was solid for the most part. Marvel needs more unique titles like this! Definitely worth checking out! Art was inconsistent at times. Is it worth your $3.99? Definitely! Rare to find a funny comic where pretty much every single joke lands perfectly. Art could stand to be a little tighter, but still one of the best first issues I've read in a while.